Within a very few weeks of the United States' occupation of Japan the civic leaders of Nagasaki, eager for good relations with the conquerors, were boosting a Miss A-Bomb contest. Can a Miss Daisy Cutter contest be far behind for the people of Baghdad? Meanwhile on the homefront, newspapers such as the New York Times and the San Francisco Chronicle have been tactful in reporting the motivation of conscientious objector Lance Cpl. Stephen Funk, a Marine Corps reservist based in San Jose. For some reason, the reporters from the Times and Chron failed to relay Lance Cpl. Funk's energetically expressed statement: "My moral development has also been largely effected by the fact that I'm homosexual." For a full account read Mary Ellen Peterson's excellent story in Counterpunch. There's no "fog of war" concerning the disaster of daily life in Iraq (what's now swaddled in that virtuous bureaucratic phrase "humanitarian crisis") is concerned. Reports confirm what all sane forecasts predicted of a US attack: it is a catastrophe for Iraqi people, particularly the poor. Last Thursday the BBC featured a vivid interview with Patrick Nicholson of the British charity CAFOD. He's just returned from Umm Qasr, where he found the humanitarian effort in the British occupied area to be a "shambles". "From the TV pictures of Umm Qasr, I had been led to believe it was a town under control, where the needs of the people were being met. The town is not under control. It's like the Wild West. And even the most major humanitarian concern, water, is not being adequately administered. Everywhere I went, the local people asked me for water. I went into the two rooms occupied by a family of 14, they were drinking from an oil drum half full of stagnant, dirty water. It was water I certainly would not have drunk. The little girl was very malnourished, skeletal, and in my experience as an aid worker I would say she had less than a week to live. "The coalition has installed a water pipeline in Umm Qasr and sends out water tankers, but the Iraqi lorry drivers go off and sell the water. Most people have no money to buy it. The hospital has been without water for three days. Inside people were very angry with me because I was a westerner. They felt angry, frustrated and let down by the coalition. Many had come to Umm Qasr from Basra because they had been told in American radio broadcasts that they would be looked after. They now say the coalition lied to them. "Adu Sulsam had brought his four-year-old daughter, Fatima, to the hospital and pleaded with me to help. He said that I was her only hope. I told him I was not a doctor. There is only one doctor at the hospital. The little girl was very malnourished, skeletal, and in my experience as an aid worker I would say she had less than a week to live. Another man had brought his 12-year-old son, Farahan, to Umm Qasr because the boy had been hit in the head with shrapnel in Basra, but had not got better after being operated on. This father also thought his child would receive better treatment in Umm Qasr. "Both men were completely disappointed. One young man angrily said to me: 'You support us when the TV cameras and newspapers are here, to show the world you like us. When they have gone you change. You have changed Saddam for another kind of imperialism. Umm Qasr was taken 10 days ago and it was deemed safe for aid agencies to enter on Monday, and yet it is still a shambles. If the coalition has trouble looking after such a small town, then what are they going to do about the city of Basra or, my God, Baghdad? If the coalition is trying to win the battle of hearts and minds in Iraq, then it is not winning by the evidence of the people of Umm Qasr." Makiya Hails Bombs As "Music"
Given this, plus the sort of horrors reported from near Al Hillah about Iraqi civilians sliced to ribbons by US cluster bombs, can one imagine that an Iraqi puppet government is going to be greeted with cheers and bunting by Iraqis. Take Kenan Makiya, head of the Iraqi Documentation and Studies Center, Harvard University and professor at Brandeis University. He is one of the more prominent people in Chalabi's group of exiles, the Iraqi National Accord. "The bombs have begun to fall on Baghdadthose bombs are music to my ears the explosion of a JDAM can sound beautiful." Probably more beautiful when contemplated from the sanctuary of Harvard Yard, than in the maternity hospital in Baghdad a US missile hit last week. "My friends in the opposition," Makiya went on, "are gathering in Kurdistan with the Iraqi National Congress and in Kuwait with Jay Garner's office. [The retired US general, intended as postwar Iraq's proconsul, noted for the public vehemence of his support for Israel.] I should be there with them, but I am told I have to stay. I am needed here, to keep touch with Washington. I cannot stand it. All I have to think about is whether or not the U.S. government is going to once again betray the Iraqi opposition." Makiya is right to be apprehensive. It was he who personally assured George Bush before the US/UK attack that the invaders would be greeted with cheers and roses, and the US high command has no doubt adjusted its estimate of exactly how close people like Chalabi and Makiya are attuned to the sentiments of the people of Iraq, who probably do not appreciate the scenario Makiya recently shared with the American Enterprise Board (at a symposium), of a "federal, non-Arab demilitarized Iraq." Such a federal Iraqi government, Makiya went on, "cannot be thought of any longer, in any politically meaningful sense of the word, as an Arab entity." So Chalabi or someone of his ilk could soon be sitting in a tent in a US military compound, hymning Iraq's new day and keeping a wary eye out for suicide bombers. He won't be a good insurance risk. Assessing the surprising extent of resistance, the US ultra-hawks are now circulating the idea that Iraq is a "deeply sick" society, not yet ready for "western style democracy", which will require purgation through lengthy occupation, with all appropriate theft or exploitation of Iraq's assets. Assuming the demise of Saddam's regime, Iraqi national resistance will be presumably led by Dawa, which is the Shi'ite resistance group, by the Iraqi Communist Party and perhaps the pro-Syrian elements of the Ba'ath Party, which has retained through years of repression, a surprising amount of strength. How long will US occupation last, given lethal assaults of the sort that killed over 200 US marines in Lebanon in the Reagan years, prompting rapid withdrawal? The Iranians are pretty good at this sort of game, and of course will be eager to speed US departure. So a flickering US casualty rate (note the disclosure last week of 175 casualties among US special operations forces, post 9/11), as now occurring in Afghanistan, could prompt a Bring The Troops Home call from Democratic contenders such as Kerry, currently too prudent to do anything but wag the flag. For historical background on such prospects, read any good account of the great uprising of 1920 against the British forces occupying Mesopotamia, which unified Sunni, Shi'a and Kurd. Zahn cross-examined "Andrew" closely on whether or not Saddam Hussein was alive. He, "Andrew", not "Saddam", allowed as how such stories were most likely US disinformation, designed to sow confusion in Iraq, also get Saddam to appear in public, at which point the US could try to kill him. The next morning Iraq released a tape of Saddam surrounded by cheering fans, in the course of which the Iraqi leader said, "Perhaps you remember the valiant Iraqi peasant and how he shot down an American Apache with an old weapon." Zahn asked CNN's Pentagon man whether this could have been prerecorded, and he said that indeed that could have been so. This raises a scenario worthy of the pen of Borges, proposing that Saddam, some time over the past few years, pre-recorded video and audiotapes designed to reflect every conceivable contingency in foreseeable history. Tape number 3045 praised the old peasant bringing down an Apache. Tape 3046 praised a lad who felled it with a slingshot. Tape 5421 contains Saddam's exultant commentary on the demise of the US aviation industry. Tape 6032 features his discussion of SARS as the retribution of Allah. Tape 8003 welcomes the onset of the Kucinich administration. Here in Humboldt county, northern California political debate on the wisdom of invasion has been keen. At a recent meeting of the county's Board of Supervisors one Vietnam vet was quoted by the Independent as saying that war was not the best way to subdue Saddam Hussein. "Why not regulate the guy to death, it works in America", the vet cried, adding that "despite the blather, bluster and BS of the AM radio crowd, Iraq is surrounded by US troops and doesn't pose a threat. "Saddam has more enemies than Gray Davis. If we pile the paperwork on him, he'll blow his brains out." "Thank you more than I can tell you for this article. The man is a purveyor of serious language-virus, the kind William Burroughs spoke of; in Wolf's case, words are drained utterly of their power, which is a kind of reverse of Burroughs's dictum but true nonetheless." "I THINK MOST OF THE MAIN STREAM MEDIA THINK WE ARE ALL IDIOTS OUT HERE. I THINK NOT! !WE ARE NOT ALL BOOT LICKERS, FAWNERS AND LEMMINGS." "I read your article about Wolf Blitzer. I've been thinking the same thing about his voice for a long time. It's so monotone . .it's like the drone of "coalition" airplanes flying in Iraq.... Have you noticed that the only time the major news networks show injured Iraqis is when there is an American soldier conveniently helping tend to their wounds? Why do I even watch?" "Occasionally I go to work at a clients office, where my workstation is positioned right next to the conference room. The TV in there is on all day long, tuned to CNN. My wife and I took the TV out of the house just before all this nonsense started. But at this office I cannot get away from it." "Your article cleared up something for me and I had such a hard time finding the adjective. it was day two of the war with CNN on--and for about two minutes--al-Jazeera's Arabic broadcasting was on. there were massive explosions--skies lit in orange blaze.. and al-Jazeera's commentator was waiting for someone else to come on. he said simply in Arabic; "Baghdad burns. What can one say?" then Mr. Blitzer's monotone voice takes over with other apparently immediate concerns that had no relevance to the image. al-Jazeera respected the moment of silence that allowed for that one image to speak for itself." "I read your piece about hating Wolf Blitzer's tv-performance voice (and George Bush's unscripted tv voice) with much pleasure. Quite right; they're both awful. "I have no explanation to offer for George Bush, whose speech is so dysfunctional that it defies description, making your piece even more admirable. I can offer one clue regarding the way that Wolf Blitzer talks, however. Long ago, there was a widely used method for training radio and tv journalists -- the one that used the "How Now Brown Cow" recording. The method included a technique for talking in a fashion that would make it almost impossible for anyone to interrupt you, and it revolved around never taking a breath at the end of a sentence. The journalist was supposed to divide up every sentence into constituent chunks after which a breath could be drawn. I believe Blitzer is using that method -- badly. It has given him a distinctive delivery that serves him well because it sets him off from the herd. "That doesn't explain why he seems unable to adjust his intensity levels to match the seriousness of what he's reporting. "Finally, the CNN person that I find _really_ infuriating is the young woman-- her name escapes me now [Could this be the ineffable Rudy Bakhtiar? Be still my heart! AC] -- who is so blasted "perky" at all times. It makes no difference whether the story she's reporting is the most horrific of tragedies, she stays perky. She sounds like one of those telephone operators trained to smile at all times, with a mirror in the cubicle to provide feedback. "For a country that portrays itself as so good, so powerful and so down-home right all the time, the collective intelligence of the mainstream media is sadly lacking. Any other foreign publication, even mainstream, sounds much more reasonable and thoughtful in its' analysis of any subject. I feel as if we are all taking part in a bad theater production with no final act. Sad, sad times these are but you all give me hope." "I just read your article on CNN and Wolf Blitzer. The physics analogy is well chosen, but incomplete. Two most important thermodynamic quantities of enclosed gas are its energy (or heat) and its entropy. What you seem to be irritated about, if I may offer a sympathetic meaning to it, is the dramatic increase in entropy (or inability to differentiate the states of the system) which also prompted me about 10 years ago to stop reading papers and watch TV. The ordinary commercials are becoming indistinguishable from the political or socio-engineering ones. I should stress that there are two entropies that are often mixed, one is thermodynamic, the other is informational." 'I'm swearing off "body counts." The descriptions of wounded and dying in Iraqi hospitals was enough for me. As far as I'm concerned, if even one person is killed -- and that number has been exceeded -- for no damn reason (and there is no damn reason), Bush Inc. are war criminals. Playing the body count game is their thing anyway. 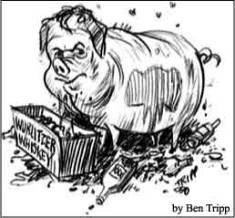 Please stop putting down pigs by comparing Christopher Hitchens to them. Pigs are clean, intelligent, and sober animals. But then I remembered that Mary's porker allusion is to Ben Tripp's delightful little drawing, below our Jampot File heading (Just Another Middle-Aged Porker of the Right). This is too good to drop. The pigs will understand and, I trust, forgive. A couple of sedate souls have deplored our criticisms of Hitchens, arguing that debate should be conducted on the lofty plane of ideas and insinuations that he is a drunken hack lower the tone. Frankly, we're all for tone lowering. Besides, how do you engage with this sort of thing on the loft p. of i. I quote from a recent Lord Haw-hawtchens column in the British Daily Mirror: "I enjoyed seeing them supervise the delivery of food and water as well, even though it was sometimes haphazard...And I can hardly say what I feel when I see them risking casualties rather than run the risk of inflicting them. But all of this--all of it--argues for more intervention and more steadfastness and not less."